PRESCOTT, WI (May 2015) – Clifton Highlands Golf Club is the first golf course in the area to make GolfBoards available to its patrons. GolfBoards are a high-tech version of an electric skateboard. Best New Product Winner of the 2014 PGA Merchandise Show, GolfBoards add a new level of fun and excitement to this sport rooted in tradition. The easy to ride, lithium-ion battery powered transport speeds up the game, is very intuitive to operate, has less impact on the turf than a golf cart and allows golfers to ‘Surf the Earth’ in a way that feels similar to snowboarding, surfing, or skateboarding. Controlling the 4WD, posi-traction GolfBoard is easy and intuitive; golfers simply step up onto the board and, using either the wireless handheld controller or the on-board thumb-throttle, gently engage power to the wheels and away they go. Users are in full control of the speed and braking at all times, while movement side-to-side guides the steering. All it takes is a brief training session and GolfBoarders are off to the first tee! Clifton Highlands GolfBoards rent for $25 for 18 holes and $15 for 9. Golf cart rentals are also still available for $16 per person. Call 715-262-5141 or toll-free 1-800-657-6845 or visit cliftonhighlands.com to reserve a tee time. Just 3 miles north of Prescott, Wisconsin, overlooking the St. Croix River Valley, lies Clifton Highlands Golf Club. Minutes east of St. Paul, Minnesota, it has been a favorite of serious golfers for over 35 years. It is one of about 20 courses throughout Wisconsin, designed by Dr. Gordon Emerson, and the one he considered to be his finest work. The Highlands offers a premium facility, available to you, at a very fair price. Best New Product Winner of the 2014 PGA Merchandise Show, the Golfboard is an easy to ride, lithium-ion battery powered transport adding a new level of fun and excitement never before seen on a golf course. The GolfBoard speeds up the game, is very intuitive to operate, has less impact on the turf than a golf cart and allows golfers to ‘Surf the Earth’ in a way that feels similar to snowboarding, surfing, or skateboarding. Traversing from shot to shot across the golf course, however, has now taken on a whole new dimension of fun, action, and excitement. The history behind the GolfBoard reads like a ‘who’s who’ in the sports, fitness, and technology world. 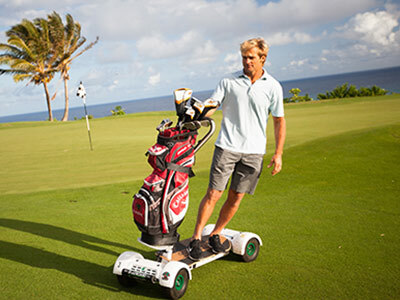 The concept of a GolfBoard was formulated when self-described snowboard addict Don Wildman, founder of Bally Total Fitness, had the original idea to use an electric skateboard to ride the steep slopes of his local Malibu course as a fun way to ‘get in some turns’ during the summer months. Wildman had the good fortune to befriend surfing legend Laird Hamilton while on a visit to Hawaii. A periodic golf partner to the Wildman when the ocean is too calm for surfing, Hamilton was interested in the concept and wanted to see this idea progress. Enter EV entrepreneur Star Faraon, a surfing friend of Hamilton’s who happened to have been forging the concept for an all-purpose and high performance electric mountain board. Faraon, with friends Paul Hodge (CEO) and Mike Radenbaugh (Technical Director), teamed up to develop a highly robust and rugged electric mountain board that, with the influence of Wildman and Hamilton, was refined into today’s safe and easy-to-use GolfBoard. Learn more at GolfBoard.com or watch a GolfBoard video.